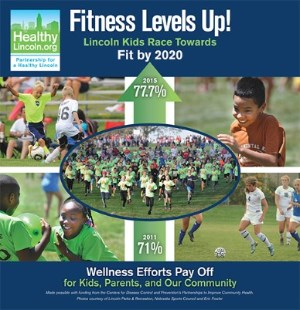 Eight years ago, leaders in nutrition and fitness from Lincoln Public Schools and two local physicians (Dr. Bob Rauner and Dr. Karla Lester) began working together to improve the health of Lincoln's school children by increasing their fitness levels and helping them reach healthy weights. Across the country, the health of our children is at risk. In Lincoln, as elsewhere, childhood obesity is at epidemic levels and the resulting obesity-related chronic diseases threaten to shorten the lifespans of our kids by up to 5 years. But in Lincoln, a coalition that includes the Lincoln Public Schools Wellness Program, Partnership for a Healthy Lincoln, and 24 non-profit organizations are reversing this trend! In 2016, we and our partners reported to our community on our joint and individual initiatives to improve the health wellness, and fitness of our city and county. Published as an insert in the Lincoln Journal Star, you can view or download this Community Update to learn about some of our collaborative efforts. In 2010, we set a goal, Fit by 2015, to reduce obesity rates in Lincoln’s elementary and middle schools to less than 15% by the 2015-2016 school year. At the start of this effort in 2010-2011, 17.2% of LPS K-8 students were obese. Steady progress has been made with obesity down to 15.4% for the 2014-2015 school year, reaching the Healthy People 2020 goal of reducing child obesity six years ahead of schedule. The 2015-2016 rates shows a continued overall trend in the decline of obesity rates. 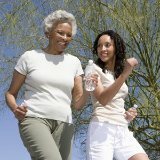 The Healthy People 2020 program is an initiative by the U.S. Dept. of Health and Human Services to address significant health issues, setting 10 year goals to decrease preventable chronic diseases that account for 7 out of 10 American deaths and 75% of the nation's spending. While obesity gets most of the press, physical fitness is even more important to the long-term health of our children. Recent research shows that kids who are more physically fit also do better academically. We also made a goal of making measurable improvements in aerobic fitness and have seen similar success. The latest data shows the number of children passing the aerobic fitness test in Lincoln Public Schools has increased from 68.4% in 2010-2011 to 77.4% in 2015-2016. With our Fit by 2015 now reached, we've set a new goal - to double our improvements by 2020! Now that we’ve met the Healthy People 2020 target for obesity, we've set a Fit by 2020 goal of a 20% overall reduction in child obesity by 2020. On top of that, now that evidence shows physical fitness is even more important, we've set a new fitness goal - having 80% of our students reaching the recommended aerobic fitness level on the Fitnessgram/Presidential Youth Fitness Program. Healthy communities start with healthy families. Family meals. Family play. Family connections. The healthy habits that are formed in the home with your family are taken to school, work, and into the community. Partnership for a Healthy Lincoln serves as a catalyst for community efforts to increase fitness and decrease obesity. You and your family can be the most powerful partner we have in this effort. What can you do to help get Fit by 2020? Watch this short video and read below for a few simple, easy tips. Cut back on sugar-sweetened beverages. More than 50% of the extra calories that we consume that are causing the obesity epidemic come from the things we drink. Switch from soda to water, it will benefit your health and save you money. Go for a walk. On average, Americans only get about half of the recommended amount of physical activity. Going for a walk is free, it benefits your neighborhood, and there are dozens of proven health benefits. Better yet, walk as a family to improve family time and make it more enjoyable. Spend less time in front of the screen. We all feel like there is less and less free time available to us, yet studies show the average American spends hours in front of a screen each day. Cutting this by even 30 minutes and using it for some activity will make huge changes in your health over time. Eat more fruits and vegetables with a goal of 5 or more servings a day. Eating more fruits and vegetables help from several angles – they are high in nutrition but low in calories, they are high in fiber and water content, and the volume helps you feel full earlier than the same calorie amount of processed foods. Together we can ensure a healthier future for our children!